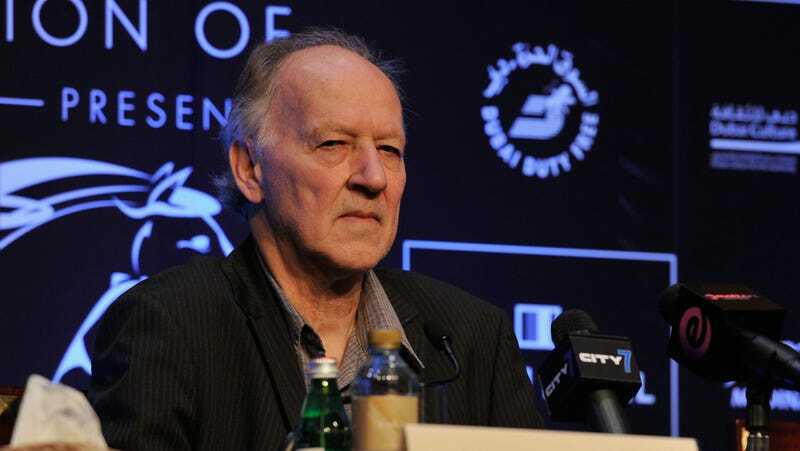 When last we heard from German iconoclast Werner Herzog he was drolly teasing a role in “a big franchise film” with the code name “Huckleberry.” Because any opportunity to hear Herzog drone in his fuzzy, soothsaying voice is a cause for celebration, we sought to figure out just what project it could be. The general consensus was that it was Star Wars: Episode IX, what with the Finn/Huckleberry Finn connection, but a new report from Making Star Wars hints that it might not be a film at all, but rather a TV series. That series? The Mandalorian, the new Star Wars TV series with Jon Favreau at the helm and a whole host of killer directors at its disposal. Yesterday, Making Star Wars posted a photo of a crew member wearing a “Huckleberry badge,” which certainly speaks volumes. As /Film notes, crew members had been spotted near the set wearing such badges, but this photo marks the first glimpse of someone wearing one on set. Mystery solved? We’ll find out eventually, but good luck trying to get a jetpack-wearing Herzog out of your mind in the meantime.